“My passion is to empower people by delivering a comprehensive & industry-leading formula that has helped me achieve enormous personal success in all areas of my own life from achieving optimal health, building successful businesses, a successful career, becoming a #1 best-selling author, speaking publicly on stage, having the desired lifestyle & income and lots more..
Now you have the opportunity to learn how to move forward in all areas of life-from career, health, mindset & money using the The Success Principles that I have adopted – and trained in through the world's #1 Success Coach Jack Canfield and his Success Principles curriculum and powerful teaching methodologies. I am also a certified Speaker & Coach trained in advanced leadership practices by the internationally recognised leadership expert and #1 New York times best seller John C. Maxwell, who was also voted by Inc Magazine as the #1 leadership and management expert in the world. Whether yourself or your audience is in small or large group settings or even one-to-one; you’ll learn powerful techniques, training, tools, resources and the experience to transform your and others like never before. Ron Malhotra AFP® PGrad. Bus. ADFS (FP) MBA AFA AChFP is an award-winning Financial Advisor, International Speaker, Advanced Mindset and Success Coach, Certified Leadership Trainer, Radio Host and a #1 Best-Selling Author. Ron's passion is to empower people, by delivering a comprehensive and leading success formula that is based on the most advanced psychology of success and proven fundamentals of wealth and prosperity. Ron is achievement-obsessed and is an influential motivator, Ron has the unique ability to inspire and transform people's thinking that is holding them back from achieving personal or financial success. Observer, IFA (Independent Financial Adviser), Investing Daily, Fox News, Wallstreet Select and Small Business Trendsetters. 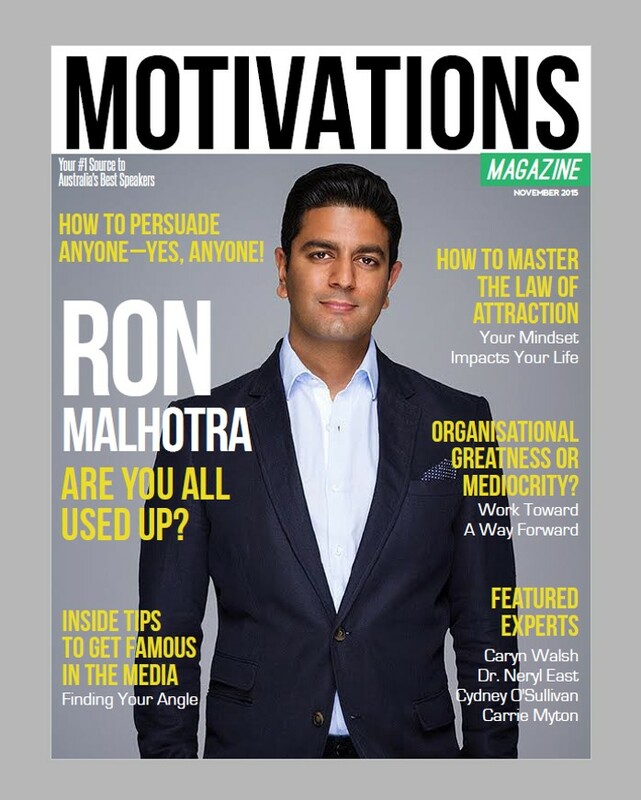 Ron is featured in Motivational Speakers Australia as a professional speaker. Ron is also a qualified and Award-Winning Financial Advisor and the founder and Managing Director of Maple Tree Wealth Management, a wealth management firm based in Melbourne Australia.